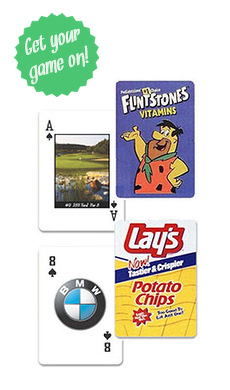 If you want to keep it simple and costs down than take a look at the custom playing cards with one color imprint. In today's world it is often referred that less is more and that holds true to this playing cards. Have a simple message to say or your company logo only one color, capitalize on the 1 color option with these decks of cards and get big savings. Have artwork to upload, perfect. If not our team of artists would be happy to go to work and create a custom design unique to you to print on your 52 custom cards. With the savings passed on to you, you can order enough for everyone to have one. These low prices allow for large quantities which will be perfect for trade shows, marketing fairs, promotional campaigns and many more events.